This post shows a very simple WCF REST Service example. Here are summarized steps. (4) Add New Item - [WCF Service] item. Name it SimpleRestService.svc. (5) Write WCF RESTful interface in ISimpleRestService.cs. 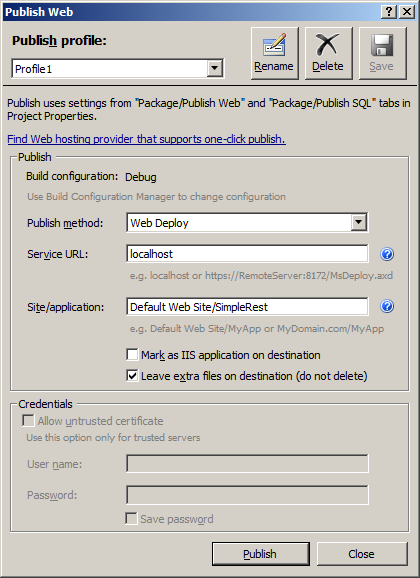 (6) Write WCF REST service class that implements the interface. For persist mechanism, the example uses a helper class for database processing. This persist mechanism is not the focus of the example, here is an example for simple db processing. Assume we have a DBCustomer table (has Id,Name,Address columns) in SQL and we created LINQ to SQL .dbml for the table. For testing, add a few sample data. 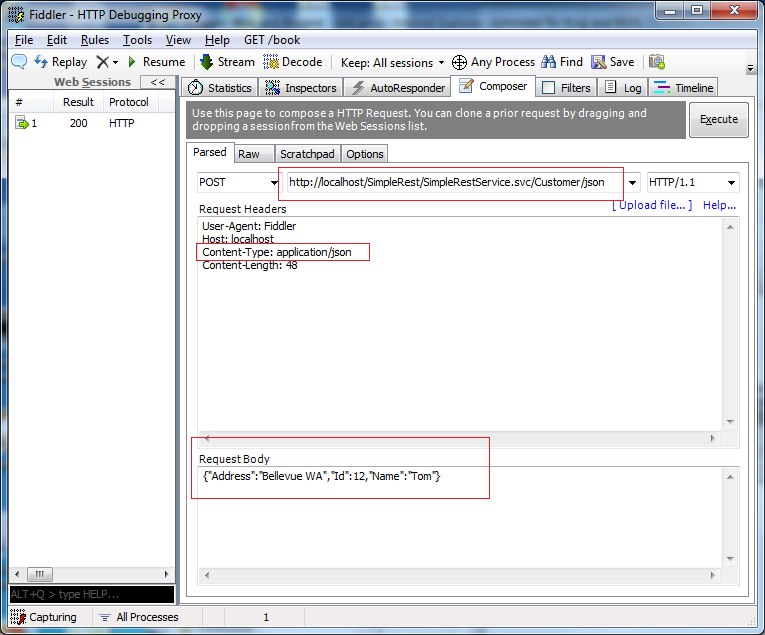 (7) Update web.config - use webHttpBinding for REST service and add REST (webHttp) endpointBehavior. <add name="TestDBConnectionString" connectionString="Data Source=. ;Initial Catalog=TestDB;Integrated Security=True"
(9) Once the REST service is published to Default Web Site, try a simple test URL in web browser. (10) Now try to get data from database. We got an error this time. When checking SQL Server error log, the failure is obvious. This is because by default [Default Web Site] application pool uses IIS APPPOOL\DefaultAppPool account but SQL does not include the account. So either add this account (IIS APPPOOL\DefaultAppPool) to SQL logins or use different account for DefaultAppPool application pool. 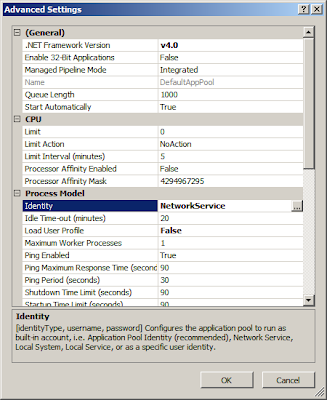 For test purpose, we can simply change IIS App Pool account to Network Service (How to: IIS manager - [Application Pools] - Click [DefaultAppPool] - Click [Advanced Settings] - Change [Identity]. Once it is changed and restart app pool, the URL above should give Name for customer id = 1. 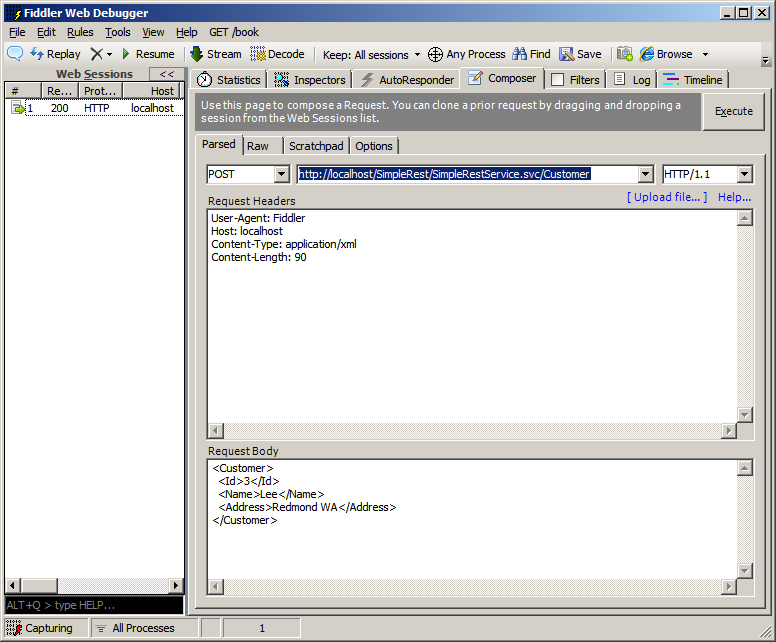 (11) HTTP GET url can be tested in web browser but if we want to send some data to REST service via POST or PUT, we write REST clent program, AJAX in html or use utility tool such as Fiddler. To write REST client program, we could use various APIs such as HttpClient (REST Starter Kit), WCF WebChannelFactory, HttpWebRequest, WebClient. But here let's use Fiddler tool. 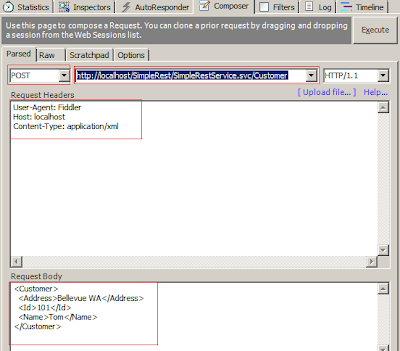 In request header, type Content-Type: application/xml and type data below in Request Body. Click [Execute] then the data will be inserted into DB. (12) HTTP PUT is similar to POST. So it is needed to fill in Request Body with data. 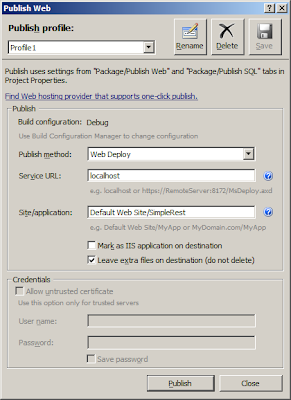 HTTP DELETE is similar to GET since the method prototype only requires Id. 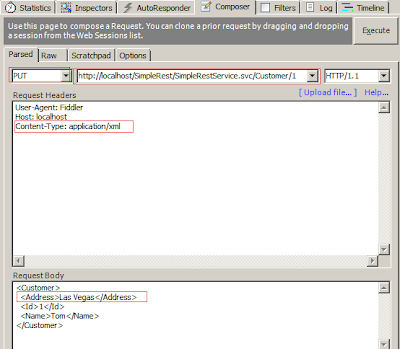 Here are some examples for HTTP GET/POST/PUT/DELETE requests in Fiddler. Instead of XML as a request input or response output, we can use simpler JSON format. Default request/response message format is XML, so if we want to use JSON, we have to set RequestFormat and/or ResponseFormat to JSON. For example, we can define new URI [Customer/json] to use JSON input and output. In order to use JSON from Fiddler, we set Content-Type to application/json and put json format input in request body as seen below. Response will be also JSON format as we set ResponseFormat to Json in WebInvoke attribute.